Curtis Granderson’s parents will join UIC Flames ballplayers, coaches, and campus officials to break ground for the University of Illinois at Chicago’s Curtis Granderson Stadium. 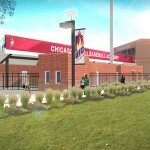 The new home of Flames baseball, the facility will also serve area youth and the Chicago community. Completion is expected in spring 2014. Curtis Granderson, Sr. and Mary Granderson (parents of Curtis Granderson), UIC Chancellor Paula Allen-Meares, University of Illinois Trustee Ric Estrada, UIC Athletic Director Jim Schmidt, and players from Flames Baseball will speak at the ceremony. Invited guests include Gov. Pat Quinn, friends and supporters. *This is an invitation-only event. Media coverage welcome. 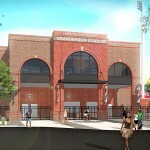 Plans for Curtis Granderson Stadium, made possible by a gift pledge from the UIC alumnus and Major League Baseball star, were approved by the University of Illinois Board of Trustees in May. Granderson, a three-time All-Star outfielder now with the New York Yankees, announced his commitment to fund the new facility at a Feb. 6 campus press conference. The contribution is expected to be the largest gift in UIC Athletics history and one of the most generous on record for the campus. The new stadium will be home to UIC’s baseball team, for which Granderson played outfield for three seasons until he was drafted by the Detroit Tigers in 2002. The ballpark will host youth league games in partnership with Major League Baseball, Chicago Public Schools and other youth organizations. 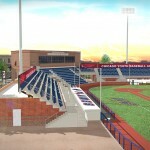 The open-air, brick-and-stone ballpark will seat 1,200, with two grassy berms for additional seating. The design includes disability seating and press facilities. The open design of the stadium offers glimpses of the action to approaching fans. 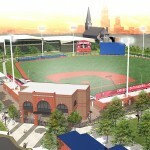 It will feature concession stands, lighting towers, and the Chicago skyline at centerfield.